"You can imagine the grunt a bus makes when it has stopped on a steep hill and needs to merge into the traffic again. A lot of black exhaust fumes whoosh out the back of them, quite often leaving people or cars in their wake. 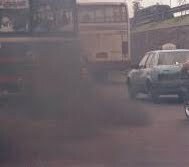 Times this by two or three buses doing this at the same time at the same bus stop, a large amount of exhaust fumes are generated in one place. Quite often after being disappointed that it wasn't my bus that had arrived, looking downwards on Queen Street, I could quite often see a great big smokey cloud slowly wafting it's way down Queen Street."